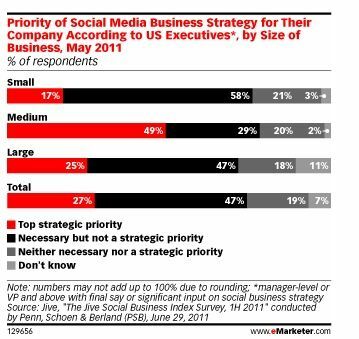 Firstly some quick stats on how US companies see the Social Marketing Opportunity. 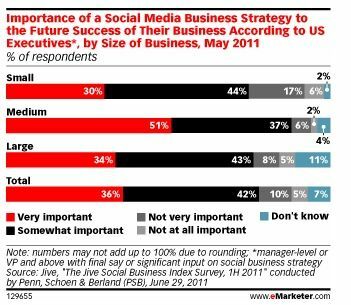 It is interesting to see that Medium sized businesses see social as a massive opportunity, those I suppose who are agile enough to take advantage of it and see real measurable return in a short period of time. While nothing will replace word-of-mouth networking, done well, Social Media is a platform to amplify this on a world-of-mouth scale. Aside from the now omnipresent statistics, the core of social marketing’s influence is actually based on traditional networking, people talking positively about your product and services. Therefore if you are talking as a passionate thought leader and engaging your audience (however small to begin with), you will win new clients and just as importantly, their advocacy. Oh and to answer the ‘teenage’ question, take note of Ruby Karp, a 13 year-old who wrote an op-ed piece for Mashable, “Facebook was this thing all our parents seem to have”, she goes on to explain “We want what’s trending, and if Facebook isn’t ‘trending,’ teens won’t care”. The Top 5 Social Media platforms have around 70% of their audience above the age of 25, and almost 45% above 35. Below are my 7 top-tips when starting off or re-aligning your Social Marketing efforts. 1. How to start Social Marketing ? We’ve all heard they saying, “the blind leading the blind”. Number one rule is don’t fall victim to this internally. Number two rule is, if the ‘expert’ you are thinking of engaging (or have engaged) doesn’t have a sound strategy around the following bespoke elements, and there is no cookie-cutting social media, get another opinion, because this space is growing faster than a gold-rush, with about the same quality control. It goes without saying they should have a background in your space, have worked with similar clients or spend time learning the intricacies of your business and the competitive landscape. A social media ‘expert’ is anyone with a Smart Phone and can talk the talk; they often believe their own hype so beware of the snake-oil salesman. The keyword here is “sharing”, what will you share that will inspire others to engage with you and share amongst their own circles. You’ve probably heard of the concept of ‘going-viral’, on a micro level this is the goal of every piece of content you’ll publish. The difficulty is, you can’t say the same thing over and over again. Working out your Content Marketing strategy is best done with an advisor and planned with a year in advance with month-to-month outlines and detail covering at least the next 1-2 months in advance. One tip here is look for day-to-day ‘actions’ or ‘events’ which may be interesting to people outside your office. Some very simple examples: Take a legal firm for example; what cases in the public domain will impact other clients? For accountants; what is your take on the new rules coming out of the ATO? In-house, out-sourced or hybrid team models? Should everyone be involved or is this the responsibility of one or a few individuals? Irrespective of where you start, test and iterate the success of the people you have involved in your social media marketing. Set realistic budgets in both time resources and financially which will support this. See my notes below on measurement and success. 4. Getting The Mix Right (Platforms)? Just like choosing the right people, you need to choose the right Social Marketing platforms. Once again, tailored advice here for your business is key. However it should be backed up, not just by wide demographic stats, but a detailed how-to on engaging qualified future clients. There are also lots of great, free or cost effective automated publishing tools to assist in reducing day-to-day costs of staff resourcing. Clients are often distracted by the wrong numbers going up, it isn’t likes you need on your Facebook page, it is sales you need improving your bottom line. You can buy 10,000 likes for around $39 online, but all it will do is degrade the quality of the social media channel you are trying to create. Building a loyal following in social media will create a significant digital channel, part of your online ecosystem. You should be able to rely on it to generate consistent awareness and sales, just like you used to rely on advertising. The essential ingredient in every digital strategy, like all great marketing success, is spending far less than it generates in profit for your business. The best thing about digital; everything can be measured down to the finest level of detail, the click. Define what one new client or sale is worth to your business, and find a way to track this back to your social spend. There are plenty of great sentiment tools and indicators to help with the detail in between, but without this objective in place from the start, you’ll burn through budget without any idea of potential success. You don’t have to post every time you eat out at a restaurant and giggle about it like a schoolgirl, but you do need to know how the posts you (as an individual) or your team (as a company) succeed online to generate results. The devil is in the detail, from #hashtags to automated API posting and time-of-day timing. Of course a little bit of knowledge is a dangerous thing too. So learn what works for your business on a conversion level and be ready to adapt. With platforms changing, upgrading and users switching between them all the time, there are plenty of opportunities across the social marketing space. For example; short videos – if you can integrate this into your content strategy do so, not only is it an engaging medium, Google owns YouTube and often publishes videos to the first page of Google, we built over half a million views for 2 clients in a few months with this strategy. The number one thing is agility. Use social Marketing as another sounding board to disrupt the way you market. Draw parallels and use feedback to shift the way you do business. If you aren’t fast enough to adapt, remember it’s a bit like the Wild West; it is the quick or the dead. "GREAT POST:)Your blog is so wonderful and Im folwnliog...I hope you follow me also:)If you want some cute swedish decor inspiration...check out my blog:)Have a great weekend dearLOVE Maria at inredningsvis.se(sweden)"